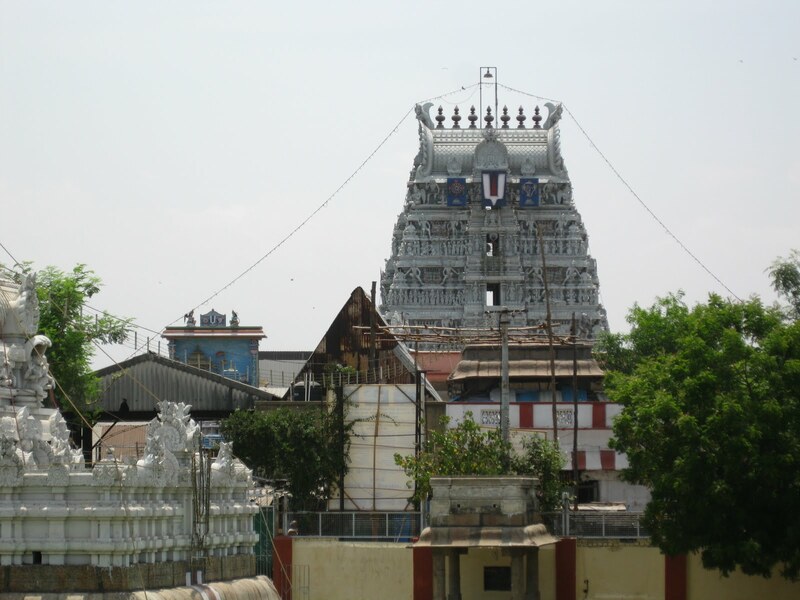 Sri Parthasarathy Swami temple, situated in Triplicane, a sector in Chennai, is about 5kms. from Chennai Egmore station. The place is well connected with frequent bus service and has a station in the Mayilai Metro Rail division. 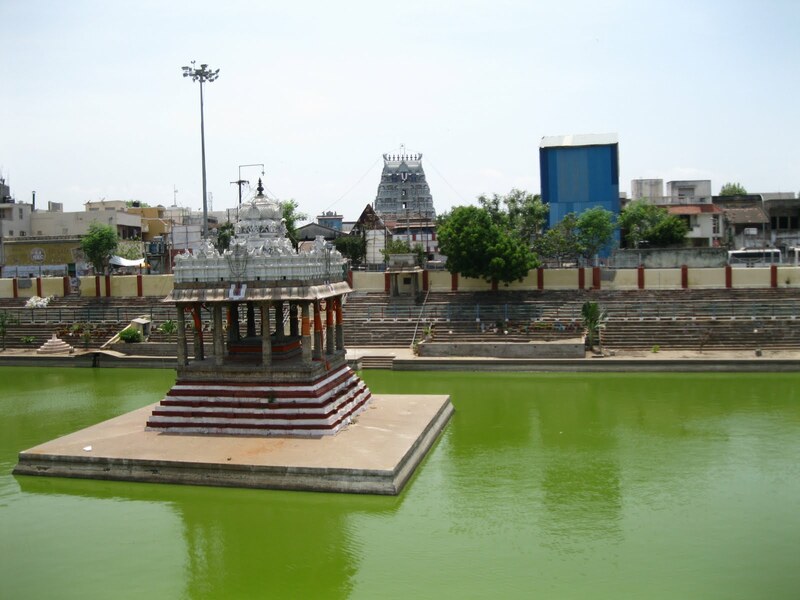 ‘Triplicane’ is the anglicized version of ‘Thiru allik keni’ , meaning ‘the sacred pond with lily flowers’ – in Sanskrit called ‘kairavini saras’. Tradition says that this holy pond carries within it five different sacred waters. The place is also called ‘Brinda Aranyam’(tulasi forest) because this area was encircled by a sprawling basil wood, once upon a time. Historically, the place is 2000 years old, which had enjoyed the holy services of the Pallava and the Chola kings – a very important holy place consecrated (mangalashasanam) by the Alvars. The Prime Deity in the sanctum sanctorum is Venkatakrishnan Who stands majes-tically with His Consort, Rukmini, surrounded by their family members, Balaraman, Sathyagi, Aniruddhan and Pradyumnan. The Lord is facing east with the Conch (Panchajanyam) in His right hand (without the Chakra) and His left hand pointing to His feet. He is the ‘Lord of Gitopadesam’ – Lord Krishna was Arjuna’s chariot-driver during the Kurukshetra War and preached him the Bhagavat Gita when he refused to take arms against his own kith and kin. The Prime Deity is a gigantic icon 9 feet high with an impressive moustache, typical of a chariot-driver – a unique aspect not seen in other Vishnu temple. The image of the Prime Deity was the gift of sage Vyasa to sage Athreya, the former directing the latter to install it in this place. Sri Thiagraja Swamigal and Sri Muthuswami Dishithar of the Carnatic Music Trinity, Mahakavi Bharathi had sung the glory of the Lord Parthasarathy. It is generally accepted that Bharathi’s Kannan songs are on Lord of the temple. Swami Vivekananda, Maths genius Ramanujam, politician Sathyamurthy had worshipped Lord Parhasarathy. Lord Gajendra Varadha appears on Baghwan Garuda praised as Perumal granting Garudaseva for ever. Saints Tirukachi Nambi, Sri Vedantha Desika, Acharya Ramanuja, Manavalamamunigal, Chakarathazhwar, Tirumazhisai Azhwar are in the prakara. Some nivedhanas are famous in Perumal temples – Tirupati Laddu, saltless rice in Uppiliappan Koil and Dosa in Madurai Kallazhagar temple. Sweet Pudding – Sarkarai Pongal is famous in Parthasarathi temple. For every 2 kilogram rice, they add 400 gm cashewnuts and 700 gm ghee in the preparation. Devotees can pay and get it prepared for them for the nivedhana of Lord. The region was once dense with Tulsi plants. Pallavas and Cholas did renovations in the temple. Lord Krishna-Parthasarathy received the arrows on Himself shot by Bishma to protect Arjuna while managing his rath in the battlefield. These scars are visible in Lord’s face even now. Based on this history, Perumal is praised as Parthasarathy – driver of Partha-Arjuna. The Ghee component in the nivedhana is more to cure these wounds, it is said. No spices are used in the nivedhanas to Lord. Praying to Lord Parthasarathy, people of unattractive complextion will understand the truth that beauty is not a constant one but may or will vanish one day due to age, illness or any other incidents in life. In days of yore, Sage Brugu performed penance here to have Lord as his son-in-law. He found a female child in the Alli flower in the Pushkarini here. He took the child, named Her Vedavalli. When she attained the marriageable age, Lord Ranganatha came to this place and married Her. This wedding festival is celebrated in the temple on the 12th day-Dwadasi in full moon fortnight in the month of Masi-February-March. Vedavalli Thayar blesses the devotees from Her own separate shrine. She does not come out in procession outside the temple but goes round the prakara only on Fridays and Uthiram star days. Lord Krishna’s role in Mahabharatha is unique by itself, promoting family harmony. As Venkatakrishna in the sanctum, He appears with Mother Rukmini nearby, Mother Mahalakshmi in chest, brother Balarama at His right and Satyagi at the left, son Padyumnan and grandson Aniruddha – with His whole family. Lord Rama grants darshan from a separate shrine with Mother Sita, Lakshmana, Bharatha, Satrugna and Sri Anjaneya. Disc is the main weapon of Lord Vishnu. He is without that weapon here. He vowed that He would support the Pandavas in the war but would not hold any weapon. As Parathasarathy, he appears without disc. He holds only the conch to announce the war. Also, He is with two hands only as Krishna in human form. A heroic appearance demands a moustache for a majestic look. Presiding deity Venkatakrishna-Parthasarathy appears with this Alankar. He is also praised as Meesai Perumal. Meesai in Tamil means moustache. During the Day 10 (Pagal Pathu in Tamil) utsav in connection with Vaikunda Ekadasi in December-January, Lord appears without moustache from day 6 to 10. During abishek on Fridays he is dressed without moustache. Against the tradition of one deity in presiding status, there are five in this temple with this importance. Lord Venkatakrishna is in the main sanctum sanctorum. Lord Ranganatha and Lord Sri Rama are in the front Mandap. Lords Gajendravaradha and Yoga Narasimha are in the prakara shrines. Hence, the temple is praised as Panchamurthi Sthala. In the Ranganatha shrine, Lord Varaha is near the head and Lord Narasimha at the feet. They are accommodated in the shrine as they accompanied Lord Ranganatha when He came to wed Thayar Vedavalli. Lord is also known as Sriman Natha as addressed by Mother when He came to wed Her. 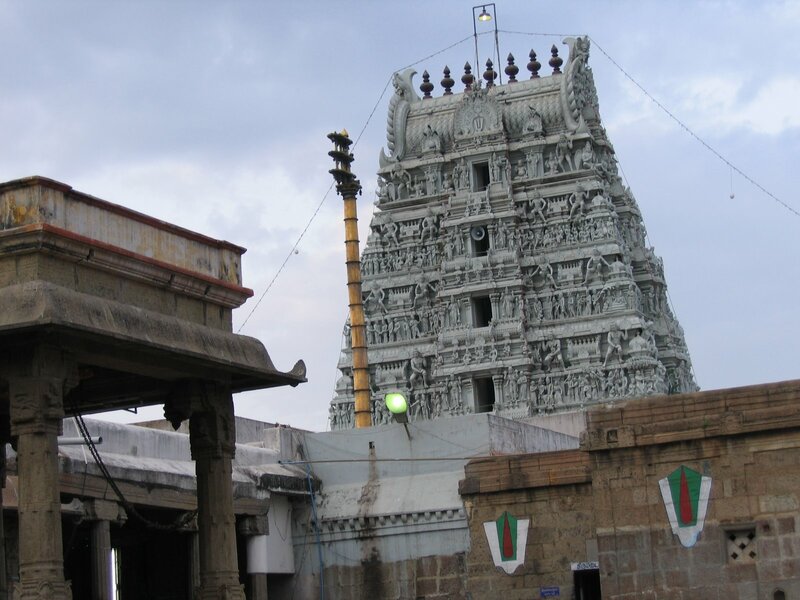 There are flag posts-Kodimarams and entrances for Venkatakrishna facing east and Yoga Narasimha facing west. Yoga Narasimha in the separate shrine is the first deity of the temple. Day’s first puja is dedicated to Him. He had granted darshan to Sage Athri. The bells in the shrine do not have the sound producing tongue in them as sound would be a hindrance to Yoga of the Lord. They are just fixed on the shrine door simply for a show. Devotees offer salt and pepper on a platform behind Yoga Narasimha praying for remedy to the illness they face. Veda Vyasa handed over to his disciple Athreya an idol of Lord Krishna and asked him to undertake penance in Brindharanya Kshetram. Legend has it that Sage Athreya came to Thiruvellikeni, placed the idol here and created the temple. 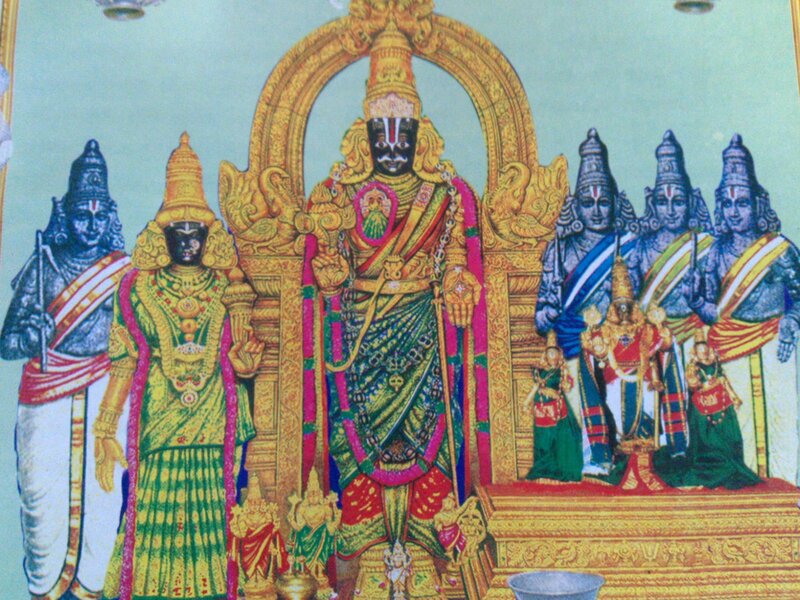 In a later period in time, a King by name Sumathi who undertook penance at Tirumalai seeking darshan of the ‘Charioteer Lord’, the one who piloted Arjuna through the Mahabharata battle, was directed to the Brindharanya Kshetram and asked to offer his prayers to the ‘Lord of Brindharanyam’. It is believed that Lord, with a conch in his right hand, provided darshan to the king here as Venkatakrishnan. Hence, this place is also called the ‘Second Tirupathi’. Vishnu devotee, king Sumathirajan by name had a desire to have the darshan of Lord as the Sarathy of Arjuna in the Kurukshetra battle field. He prayed to God for the darshan which Lord obliged as controlling and managing the rath of Partha-Arjuna. The king begged the Lord to stay in the place in the same form. Perumal appears only with His conch and not the disc. Lord absorbed the arrows shot by Bhishma aimed at Arjuna and thus sustained injuries. The scars are visible even now. Parthasarathi is the procession deity. As He grew prominent among the devotees, the temple came to be known as Parthasarathy temple. 06:00 am to 12:00 noon ; 04:00 pm to 09:00 pm. 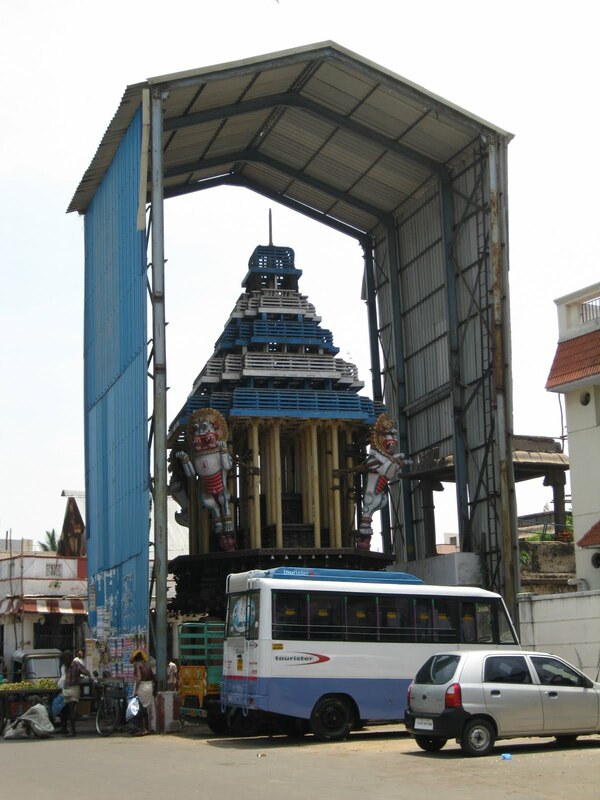 Triplicane-Tiruvallikeni is an important division in Chennai city. Town buses are available from every corner of the city to reach the temple comfortably. Electric train facility is also available.